Here are some of my candy Christmas trees. They really are easy to make and are very attractive. I am still experimenting with them. Finding the narrower wire ribbon has been a challenge! I saw another picture of some trees that used tulle (not netting - netting won't stay pinned to the styrofoam cone!) instead of ribbon. Personally I like the all ribbon version best, but because of the lack of narrower ribbon, my second choice is a bow on top and fill in a little with the tulle. Regular pins do not work well with this craft. They don't tend to hold the candy well. I used T pins and larger ball end pens. I liked the T pins best but wish I had found smaller than 1 1/2 and 1 1/4" pins! Obviously that is something that should be in my craft storage from now on! I LOVE Thanksgiving! I love EVERYTHING about it! I am of an age that when I was going to school, we were taught what Thanksgiving was truly about! A time when the pilgrims came together with the Indians and they thanked GOD in heaven above for bringing them to this land, this land where they could have religious freedoms, and worship the TRUE God without persecution. I am thankful for the God of Salvation! I am thankful. I am thankful for the land in which I live. I pray for our country that we can return to our roots and stay true. I am thankful for my family. God has truly blessed me! I am thankful for the things that plague me, for they make me stronger when I lean on Him. I am thankful for a roof over my head, food and clothing. I pray that God makes me a blessing to others. 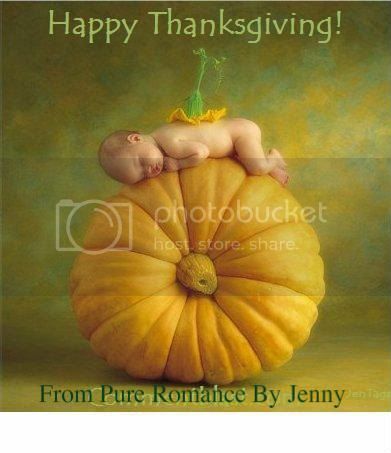 Happy Thanksgiving, my friends! I am thankful for each and everyone of you! You enrich my life, whether you be a close friend or an acquaintance, you have a place in my heart and I am thankful for you. One in particular, I would like to address. Lori, I hope you are reading. You are a very new online friend but we have shared our hearts thru the love of our special daughters. I know that you closed up your blog and I have missed you. I want you to know that you and your family are still in my prayers and I pray that God will lead you thru this time now!!! For more Wordless Wednesday,click here! I didn't know Brenden Foster, but I certainly heard a lot about this remarkable, inspiring young man the past few weeks. Brenden died of leukemia on Friday, November 21st, just one day after his dying wish came true. The Make a Wish Foundation offered Brenden a trip to Disneyland. Brenden refused the offer and said he wanted to feed the homeless. KOMO TV, a local TV station held a food drive in his name on Thursday, the day before Brenden went to be with the Lord. They stuffed I don't know how many 53 ' trailers and made over $60,000 to feed the needy. One woman donated a check for $20,000! Brenden is an inspiration ! I am touched in a way that I cannot express. I was listening to Reba Duets on Saturday and she and Carole King were singing "Everyday People". It is one of my favorites and it will now forever remind me of this young boy. God bless his family and comfort them in their loss. Heaven was made much brighter on Friday with the presence of this sweet and caring boy. You can see some of his story here. There are many MANY stories if you just google Brenden Foster on the internet. I love where we live. A little foggy this morning when I went to take pictures!! We have a comfortable home that sets on the side of a hill overlooking the Puyallup valley. In that valley is Hwy 167 and industrial warehouses but it is still lovely. Across the way we can see the east hill going up to Lakeland and an old power plant. When we first moved in here, 4 years ago, we could sit in the living room and see the traffic on the freeway and at night see the cars across the bottom of the east hill traveling on East Valley! I can't see that anymore! This hedge below us has grown so much that we have lost that view! Time to get it trimmed down! Likewise next to our home are two large trees. One VERY large. And although they are beautiful, they block a lot of the light coming thru to our home. We sit in the breakfast nook and look out the window and see the tree base. Can't see the car coming up into our driveway or our neighbors. And these trees block the light getting to our neighbors home. Oh and did I mention that the biggest one is feeding off the septic system????? The roots were putting our septic system in danger and that gets pretty expensive to fix! Time for it to go! So the work begins. We hired an acquaintance and he is confident with all that needs to be done. First lower limbs get trimmed off the big tree. His two helpers begin on the hedge and get the chipper going to throw the trimmings back down on our hillside. Look at how just trimming up the lower branches has opened up the light and view from our driveway!!!!! Scott has trimmed the branches enough now and it is time to tie the line and fell the tree!!!!!!! The notches are made and I begin to hear a crackle!!!! You can see it just starting to fall! And there it is down on the street! Text book tree falling!!! PTL! Great job!!!!!! This tree has been feeding very well! We estimated the age to be about 18 and we count 19 VERY large rings! The tree is down. The wood must now be trimmed and cut into pieces and stacked for my son. The hedge will have to wait for tomorrow. By the time I get home from work it will probably be mostly done! I can hardly wait to see it!!!! What a blessing to get this done! These are so cute and would make a nice stocking stuffer, gift, card enclosure, gift for a teacher. You could use 3 D already made stickers or stamp, what ever makes it fun and easy for you! I love Dawn's tutorials. Great ideas! I have made this a couple times for Thanksgiving now and it is very good and a time saver for the day of Thanksgiving! We are eating at my daughter's this year and was just sharing it with her via email and thought it would be a good thing to post here! I can never find wings, so I use legs and it works up GREAT! And the legs can make a pretty tasty meal! 1. Heat oven to 400 F. degrees. Have ready a large roasting pan. 1 1/4 hours until the wings are browned. broth(refrigerate remaining 2 cups), carrot & thyme. Bring to a boil reduce heat & simmer,uncovered, 1 1/2 hours. 4. Remove wings to cutting board. When cool, pull off skin & meat. Discard skin; save meat for another use. 6. Whisk flour into remaining 2 cups broth until blended & smooth. week or freeze up to 3 months. drippings to the heated gravy. Granddaughter and I had fun today! My granddaughter came over to spend some time today. I decided we needed to have some craft to work on. I found 2 that I liked over at Lori Jeans blog. First I gathered all the materials that we needed for making our projects and laid them out. Decided on making the Candy Christmas trees. Next I gathered up my helper. Well only one of the helpers was invited, the other just thinks he has to be where things are happening! These worked up quickly. I need to find more wired ribbon and when I do I will post a better picture of all that we did, but we were pleased with the initial efforts! Soon we had more helpers join in! And MORE!!!! I don't know how much help they were! But we had fun and enjoyed each others company!! This little one sure likes her Papa.... he wasn't having a very good day before this one showed up so she helped bring smiles out in him!!!! My daughter went home and made up some gorgeous glass blocks with some graphics we printed out. Click here to see them! 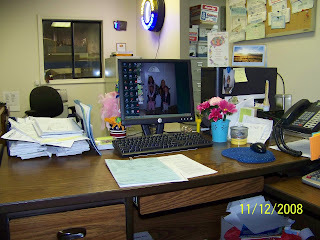 This is part of the Wordless Wednesday Carrnival hosted by 5 minutes for Mom. These two beautiful ladies are my dear daughter in law and my friend, her mother. Yesterday was our grandson's 7th birthday. We all had a wonderful time celebrating his 7th birthday. Mom is a gracious hostess and plans fun events for all. Dinner was Chili, cornbread and salad. The cornbread was REALLY different and delicious! It was a recipe from Shelley's grandmother and Shelley shared the recipe with me before I left. Now this is not you usual cornbread and I do love my recipe but this was SO good! It was moist and dense and more cake like! If you try it let me know how you like it. It does not need butter at all! Combine all ingredients and beat well. Turn batter into a greased, heated 9" skillet or corn stick or muffin pan. (Shelley doubled the recipe and placed into a greased enamel 9 x 13 casserole dish). Bake 400 degrees for 30 minutes. Outside My Window... It is dark and foggy and chilly and damp! I am reading... nothing I need to get going on my sewing for Christmas. I am hearing... my furnace kicking on - the dog sighing next to me. I am going... to (sigh.........) work. Around the house... Decorative pumpkins, autumn leaves and florals arranged on the dining room taable. One of my favorite things... a nice cozy fire! 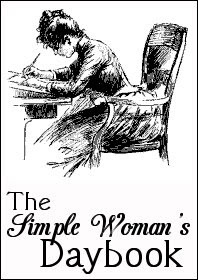 See what others have to say at The Simple Womans Daybook. We always love family birthdays!! It is always fun to spend a day with the grandkids especially when it is a birthday! Here is the birthday boy. I think the highlight of his day was when he was "blindfolded" and his dad wheeled in his new bike. When he opened his eyes and saw the bike, he was speechless and immediately ran to dad then mom and gave them BIG hugs and thanks. That before he even got on the bike!!! All 15 of my grandchildren in the same place all together! That was a highlight for me!!! Another Award! Thank you Crafty Sue!!! Isn't this a gorgeous Award? I received this new award from Crafty Sue with this motivation, "... simply because their blogs deserve this award, they are creative, interesting and very cool!" Thank you Sue, for the compliment AND for the award!!!! The rules are the usual as most blog readers already know. 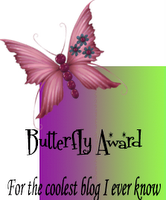 I would like to give this award to all the blogs in my blog list as I think they are all deserving but I have to choose only ten as the rules say, no offence to all the rest I hope. Because their blogs deserve this award, they are friendly, creative, interesting and very cool! 7 Diane of Where do I get Started??????? 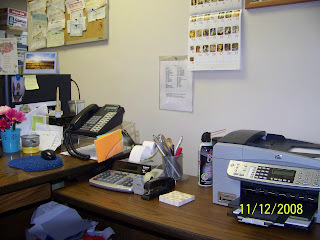 I am showing you this by taking part in Marcia, The Organising Queens, show me your desk challenge. To see others pictures of Wordless Wednesday click here. Talk about Tuesday -- Do You Think We will finally get some sleep tonight!? "Take Sominex tonight and sleep..... safe and restfull, sleep, sleep sleep..." Just delivered and I am so excited. We got a Simmons Beautyrest and are so looking forward to getting a good night's sleep... too many aches and pains for us "old" folk! We also got these fantastic new pillows that seemed to feel so good at the mattress store! Looking forward to finding out if they help too. GOOD pillows are so hard to find and believe it or not these pillows have a 10 year guarantee as well! Wow! We have been sleeping on a mattress that was barely 4 inches deep. NO support and this is going to be a wonderful change! I will let you know how we slept in the morning! Now I have to go make the bed. Oh.... and no, the dog is NOT getting up there but he has to be where I am! For more Talk about Tuesday click here. Free Cup of Coffeee at Starbucks today only!